· Sargotsavam – The cultural festival of performing arts and literary competitions. The NCR level Sargotsavam is considered as the Second biggest Youth Festival in the World, the First being School Youth Festival of Kerala. 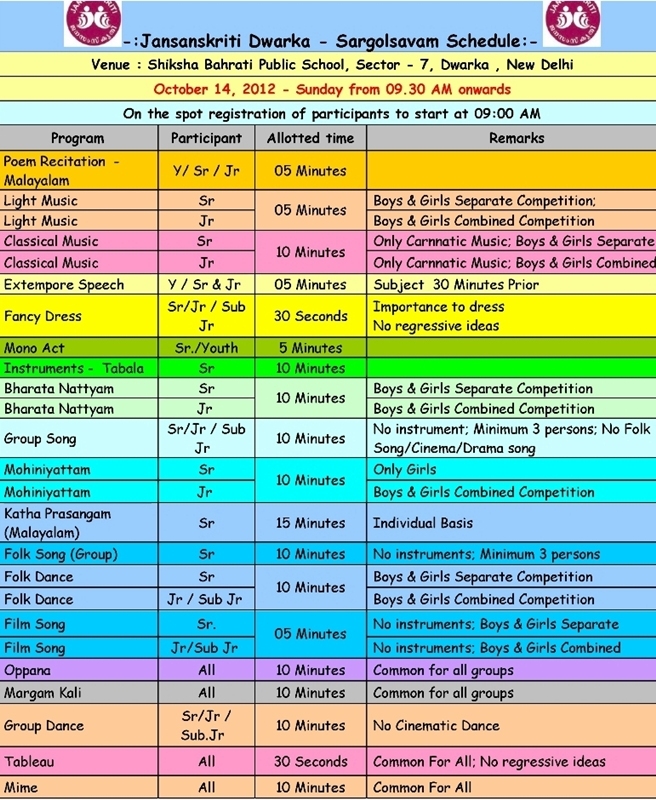 Jansanskriti, Dwarka is organizing a Children’s Competition Festival Sargotsavam 2012 on 07th and 14th October, 2012 at Shiksha Bharati Public School, Sector 7, Dwarka, New Delhi. Competition are held in more than 60 items of performing arts including Bharata Natyam, Mohiniyattam, Folk Dance, Classical music, Film songs, Light music etc., along with painting, drawing and literary competitions. Painting, drawing and literary competitions will be held on 07th October 2012 and competitions in performing arts will be held on 14th October 2012. Ch Lapsiya is a rare combination of Art & Thought.